Canada, 1970, 103 Minutes, Colour. 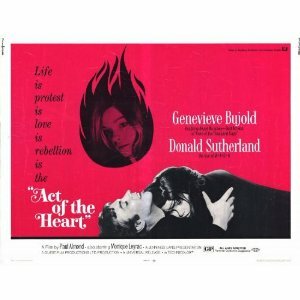 Act of the Heart is a melodramatic story written and directed by Canadian Paul Almond. He wrote it for his wife Genevieve Bujold. He had previously worked with her in Isabel. This was the period when Genevieve Bujold had reached international fame with her portrayal of Anne Boleyn in Anne of the Thousand Days. Since then she has gone on to acquire a strong reputation as a serious actress. The theme of this film was one popular around 1970: the crisis in the life of a Catholic priest. The focus is on celibacy and marriage. Donald Sutherland rather effectively portrays an Augustinian priest who comes into crisis. (This was the same year that Sutherland appeared in such films as M*A*S*H and Kelly's Heroes.) The setting is Montreal and there is a clash of religious beliefs and practice. Genevieve Bujold portrays a young girl with intensity, sense of vocation and seriousness, falling in love with the priest. While the ingredients sound melodramatic, they are generally worked out well except for the final, sudden and brutal ending. A comparison for this film could be Daniel Haller's Pieces of Dreams. 1. The impact of the film in 1970? Now? The relevance of the issues now, in the past? 2. The production qualities of the film? Canadian backgrounds, appearance, atmosphere? 3. The significance of the title, its reference to the main characters? To the issues of priesthood and vocation? 4. The nature of the screenplay and focus on Martha, the importance of the editing, the techniques of overlapping? The contribution of the flashbacks, the flash-forwards? The freeze frames? The special effects? 5. Could the film be characterized as religious or not? In topic, style and treatment? On sites? 6. How plausible was the plot? Did it seem real and authentic in terms of character. situations, coping with situations? How symbolic were the episodes and the characters? The use of symbols throughout? The ending and its meaning for relevance? 7. The tone of the opening, the flame, the coffin? Martha's imagination? Themes of death, indications of love and sacrifice? The recurring themes and symbols? The meaning of the ending? 8. The presence of God in the film? Special presence to Russell? The continually visualizing of the cross, especially in Martha at Russell's death? Christ and his experience of God, of the loss of God? Martha's identification with Christ? The discussions with Michael at the end about the significance of Christ's sacrifice? Her final act of the heart and her sense of vocation? 9. The portrait of Martha, as a character, her presence in her church, her work in the choir, her ability to sing, the audition, the nightclub? The revulsion of the nightclub work at first, her having to sing and earn money at the end? The role of her parents, especially her father, the letters and telephone calls? Her fear of hospitals and the reasons for this? Martha as alone, seeking for a job, her need of money? The family welcoming her in the house, scenes showing her at work at coaching and her sensitivity? The importance of her room? 10. The special friendships that she had: Dietrich, Father Ferrier, Joanne, Russell? The importance of the skating sequences and the effect that it had on her? The relationships in the choir? Father Ferrier and the skating, the choir, the tour of the church, the confessionals? Her relationship with Joanna and work in the house? The importance of her drunken sequence and what she revealed of herself? The importance of her not going to the hospital for Dietrich, for Russell? The importance of talking things over with Joanne? 11. The contribution of Russell to the film: the hockey, the skating, the lessons, seeing him in hospital, the bonds? The impact of his death and the way this was communicated, especially Martha on the telephone and her not being able to realise it? The funeral, the effect and her loss of faith in God? 12. Joanne as a person, wealth and background, parties, religion? Her employment of Martha, talking to her? The importance of the image of the widow, loneliness? The contribution she made in listening to Martha? 13. The contribution of the singing, the choir, the way that the choir was filmed? 14. The impact of Father Ferrier, his background as an Augustinian? His initial impact at the audition and the lack of ecumenical treatment by the choirmaster? His status as a priest, presenting himself as a priest? The importance of his sermon and the Third world overtones? The Augustinian tradition and incorporating this into the Cantata? The discussion about love? In St. Augustine's atmosphere? Poverty and his ideals? The skating sequences, visiting her? Encountering her at the hospital? The tour of the church, Martha and the candles and confession? 15. How plausible was their falling in love? Their talking? The decision that Father Ferrier made? Their mutual confessions? Discussion about confession and love, death and symbolic acts? The consummation of their marriage in terms of ordinary life, Michael writing, Martha singing, the discussion and the death? 16. The change of atmosphere with the way of life after their living together, the nightclub? 17. The significance of the final gesture and sacrifice? 18. The insight into a person with a special vocation, sense of individuality and destiny? Martha’s comments on her understanding of herself, the mystery, trying to add it up? 19. Insights into love, self-giving? Realism and romanticism?